It was probably around University time I started going a bit crazy with buying trainers in different colours and styles, my part-time job in a department store didn't help much as this was the start of my compulsive spending habits. Luckily, I've improved a lot, although it may not seem it at times. From owning Nike Tn trainers to Reebok classics, the love for trainers was not going to stop. Below are a few of the trainers I own at the moment along with some trainers I wouldn't mind having to the collection, mainly the classics. My most worn trainers are my converses, can be worn with just about anything from a suit to a dress. I invested in the converse high tops too and love them (Although getting them on can be a struggle). My Adidas Stan Smiths are another pair I own that are comfy and again goes with everything too, I have the ones with the green tab at the back which are their classics but eyeing up other colourways. My New Balance trainers are one of the comfiest trainers I own, I saw an off-white pair last year at their outlet and regretted not buying it for £30! The yellow reeboks I have, I bought after falling in love with the colour, they definitely make a difference to a basic outfit. I owned a pair of the Reebok club C 85 vintage trainers but sadly had to return them due to a fault in the leather. I would definitely recommend them for comfort too. The vans were everywhere last year and year before, I didn't think I would invest in a pair purely because I have black converses but I finally gave in this year. I need a while to get used to them as they are not the easiest to get on at the moment. I'm not sure what my next pair will be, but I'm liking all the pink trainers I'm seeing. I wanted another pair of Stan Smiths but now thinking I have too many white trainers?! But they do, all look different? 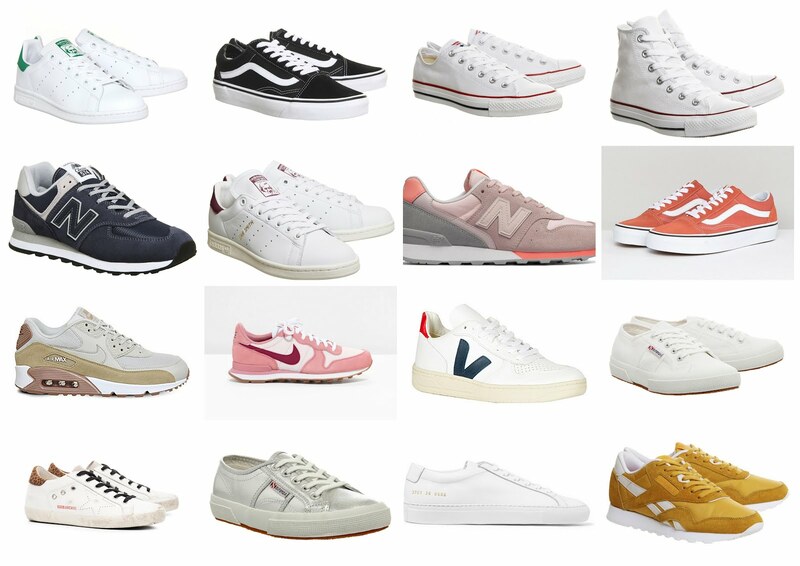 What's your favourite trainer and are you into the big chunky 'dad' trainers in at the moment? Thanks for reading as always, happy shopping!